‘America, We Served!’ - Times Publishing Newspapers, Inc.
For over three hundred years, African Americans have made incredible contributions to the United States Military. 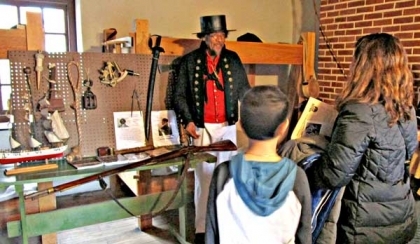 This February 23rd and 24th from 10:00am to 5:00pm, learn about the impact made on war efforts by black soldiers throughout American history at the Old Barracks Museum. African American historians, re-enactors, and veterans will present artifacts, information, and insight highlighting the integral role African Americans had in our nation’s history. The Revolutionary War will be represented by the predominately African American Rhode Island Regiment. The Civil War will be represented by The 6th Regiment United States Colored Troops. World War II will be represented by The 5th Platoon. Other authentically kitted out re-enactors will represent the War of 1812, the Buffalo Soldiers of the American West, and the Harlem Hellfighters of World War I fame. Don’t miss this wonderful educational experience for the entire family! Tours of the Old Barracks Museum are included in the admission price, so you can also learn about the last remaining free-standing French and Indian War military barracks in North America. Included in regular admission. Special admission price of $5 per person for residents of the City of Trenton. The Old Barracks Museum is located at 101 Barrack Street, Trenton, NJ right next to the State House. Parking is available in the small lot next to the museum, in the Capitol Complex, and in Trenton City Parking lots – the closest is located at 120 East Front Street. For more information call 609-396-1776 or visit www.barracks.org. The Old Barracks Museum preserves the history of a building that was built as a French and Indian War military barracks and used as a Revolutionary War Patriot hospital. It also stood witness to Washington’s crucial victory at the Battle of Trenton. In 1903, members of the Daughters of the American Revolution and the Colonial Dames organized The Old Barracks Association and spearheaded a campaign to fund a major restoration. The building has been used as a museum for over a century, and has frequently been used as a symbol for the state of New Jersey. The Old Barracks Museum welcomes visitors from across the state as well as around the world. PHOTO CAP: Visitors learn about African-Americans in the military at the Old Barracks Museum.